There are many ways to campaign for food security, but perhaps the simplest, most direct method we can each use on our own is to expand our knowledge about the ingredients that we put into our food. This begins with knowing their names, the characteristics of their flavours, where they are found, how they are harvested, and the nourishment they provide to our bodies. Sometimes such ingredients are hidden away in the dark corners of our fresh markets, or at simple food stalls by the roadside, or in unused land such as on the banks of the roads reaching through the countryside just waiting for us to understand them… to get it… and to begin to notice their existence. That’s the way with “Tree vegetables”, or pak-yuen-ton, the ingredients often used in Thai cooking that come from perennial plants, including flowers, leaves, fruits, beans, gourds, seeds, nuts etc. 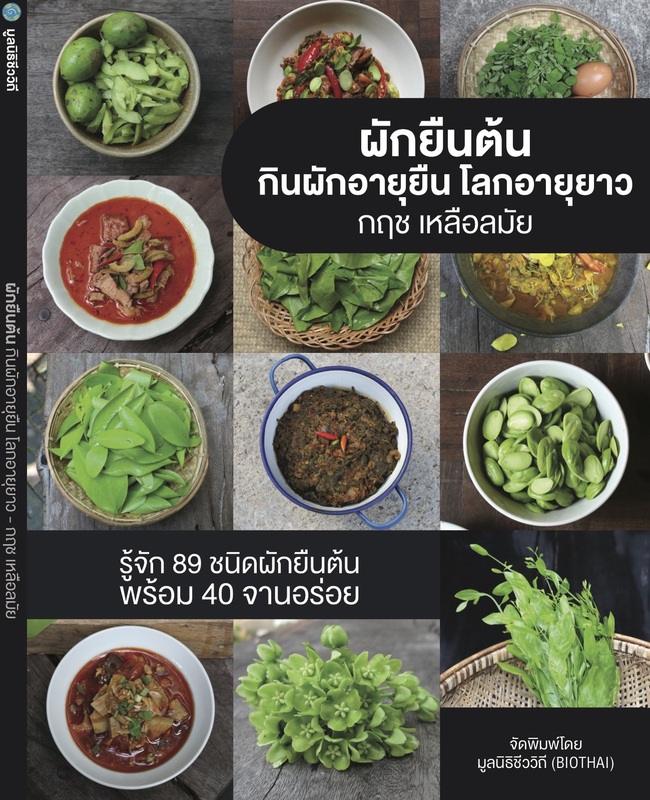 This little introductory book may change your perspective on the flavours and recipes that shape the foods that Thai people have enjoyed for so long. It may tempt you to think of new ways to search for and gather your food and even ways to manage public spaces. Or it may spark your interest in protecting the places where we can find safe food in today's world, increasingly a critical issue, subject to the growing influence and profit-seeking of many sectors. Some of the vegetables represented in this book grow to be years, decades, some even a century old. We may have to put some effort into redefining the status in Thai society of “tree vegetables” before we can start to get to know them. To this day, even with the interest there is in conservation of green spaces and forests, in urban and rural areas, from both the government and the private sector, through countless discussions, lectures, forums, and pilot projects such as tree banks, reforestation funds, over the last half century, the importance of these food crops has barely been discussed in the wider public. We hope that this book Tree vegetables: Perennials for a long life and sustainable planet can mark a starting point for this discussion.